Note: Technically this is the 19th event of Tarantino's March Madness however it is only the 12th event I've attended. I missed the "Crack House" and "Redneck Miller" double bill to kick off the month, the night of Ralph Bakshi animation with "Coonskin" and "Hey Good Lookin'," as well as the first midnight feature of March Madness, "Shame of the Jungle." Sadly I missed Tarantino and Robert Rodriguez's extravaganza "Grindhouse" and "Machete" double (triple) bill as well as "Man Friday" and "Cooley High" double on March 16th and 17th. I also missed (due to an illness) the legendary Robert Mitchum vehicle "Thunder Road" and "Five Minutes to Live" starring Johnny Cash and finally I missed the midnight screening of the Ice Cube's pot smoking comedy "Friday" on March 25th. This event is the final midnight feature programmed of Tarantino's March Madness. Following this showing the Bev would prepare for a two week long sold out stint of "Kill Bill." As I've done in all of my previous posts I would like to quickly cover the trailers that ran ahead of the "The Fighting Fists of Shanghai Joe." We only had two trailers in front of the midnight feature, "Kill Bill" and "Pulp Fiction." I'd seen a lot of the Kill Bill trailer having attended so many of the events during March Madness and one last time before seeing the movie the following day was just fine. 'Fiction' is a regular midnight experience at the Bev, one that for one reason or another I've never seen there. The biggest reason is because I can't sit through Pulp Fiction anymore. I love the movie endlessly, but I've seen it one too many times and know I would be like a flopping fish on the pier trying to sit still during Tarantino's second film. 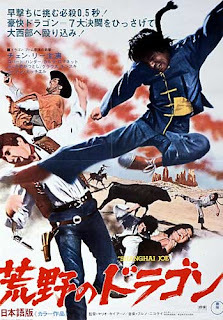 "Shanghai Joe" is one of those movies that has a number of titles including "The Fighting Fists of Shanghai Joe," "To Kill or to Die" or "The Dragon Strikes Back" and those are just the English titles. The film is an Italian spaghetti western filmed in Italy yet set in Texas directed by Mario Caiano. It follows a Chinese man Chin Hao who has come to America in search of becoming a cowboy. Once Chin Hao is here he quickly realizes that his dream of leading a life on the ranch may be impeded by racist ranchers who want him off their land. It features a fabulously compelling score by Bruno Nicolai that has a returning theme immediately whistle worthy like most of the classic western scores. Nicolai was good friends with Ennio Morricone and one listen through 'Shanghai Joe' you'll see how close they were. I'll go as far as saying this score could've been written by Morricone and people wouldn't have noticed a difference. 'Shanghai Joe' is a movie that I found to be excellent in moments and very sluggish in others. It takes awhile for the film to really get its momentum going and doesn't realize when it has overstayed its welcome on one particular scene. Chin Hao or Shanghai Joe as he is referred to throughout the film takes up fighting for Mexicans who are being sold into slavery, or at least that is what we are told. Chin Hao more or less stops a bunch of dumb ranch hands from killing a new recruitment of slaves and because of that, the ranch owner sets out to have Joe killed. Logic goes right out the window at this moment in the film. If you want you could blame an extreme amount of racism but mainly this ranch owner is too stupid to see that his own ranch hands are at fault and blames Joe. While defending himself, Joe repeatedly kicks the crap out of said ranch hands from their attacks. By the way, all of this is still within the first act of the film. Finally the ranch owner decides to hire skilled bounty hunters to kill Shanghai Joe, then the film actually picks up the steam. Director Mario Caiano spent just a bit too long setting up his lead character against half-witted and nameless thugs. It is in the final half when Shanghai Joe is facing four or five worthy advisories that your blood really gets pumping. Had this film shortened the intro and lengthened the bounty hunters it could have been a far bigger and more effective film. I'm not here to spend a bunch of time talking about what if's and I wish's, so let's talk about what does work. 'Shanghai Joe' features a number of fighting sequences/stunts that go down as purely awesome. First, the bull sequence. In true gladiator form, Shanghai Joe is placed inside of a bullfighting ring to face a ferocious bull. Much of this sequence is of Joe dodging the bull's advances but we do get a number of blows and tramples inflicted on Joe by the bull. Just when you think Joe has met his fate, he karate kicks the bull to the head instantly killing it! That was a cinematic first! A kung-fu kick to the brain of a bull, I'm thinking my night was made but that wasn't all. We also see a stunt Quentin Tarantino uses in Kill Bill. A friend of mine immediately mentioned "Elle Driver" after the credits rolled and it only seems obvious that Quentin would program the film he took the vicious stunt from and run it the night before the film said stunt is in. The stunt itself is the eye-gouge and eyeballs isn't the only thing Shanghai Joe is willing to gouge out. Let's just say that Mola Ram would be most pleased with the feats old Shanghai Joe is pulling off. One thing I found endlessly endearing about Shanghai Joe was his howling leap. Joe would lunge at an opponent with a deep "Eeeee" and every time he did it I would get a huge kick out of it. I was also thoroughly satisfied with the amount of hand-to-hand combat. 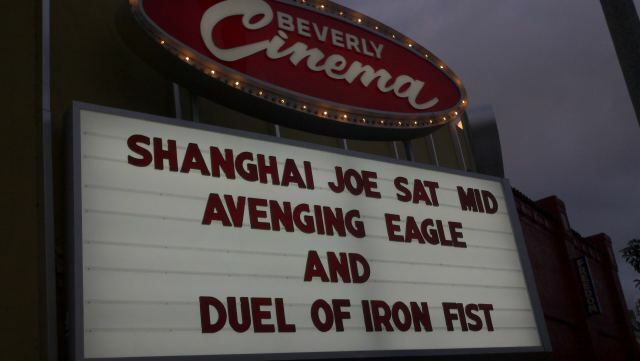 If you've been reading any of my previous coverage you may noticed I did a bit of sniveling about the lack of fists and the over abundance of weaponry, Shanghai Joe is filled with plenty of kung fu. Chen Lee isn't the most skilled martial artist we've seen by any means, but he certainly gets the job done and definitely knows how to make the fighting look gritty. Outside of a few noticeable wire tricks all of the fighting was well choreographed, full of energy and contained plenty of shock and awe moments. 'The Fighting Fists of Shanghai Joe' like most of the films programmed throughout Tarantino's March Madness was laced with racism and prejudices. Films that illustrate the underbelly of America. Also common with the rest of the programming was a film that didn't pull any punches. It was blunt and direct and gave no regard to its offensive nature. That is part of what makes them so lasting and so memorable. As evil as they are, these films are honest depictions of society. We all know life isn't always so rosy and praise should be awarded to films that step outside of traditional norms and bring attention to the negatives. Some of the films certainly relished in the stereotypes on screen while most just effectively portrayed them. Shanghai Joe falls in the latter. In a period of time when Chinese Exclusion Act had just been lifted Americans were very weary of new Chinese immigrants coming into their country and taking work. Combine the fact this film takes place in a southern state that was pro slavery the amount of racism that is aimed at Shanghai Joe is warranted and necessary to properly depict actual events of the time. 'The Fighting Fists' may not be the best spaghetti kung-fu western out there but it is definitely deserves mentioning and I am tickled that Tarantino closed out the midnight programming with such a enjoyable thriller. While the month of March is over Quentin Tarantino's March Madness is still rolling through April 7th. 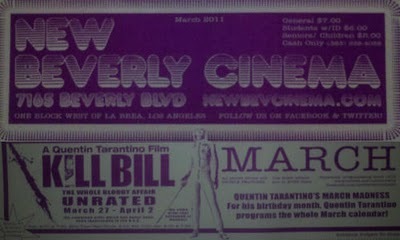 The 2004 Cannes cut to "Kill Bill" is in its second and final week at the New Beverly. Tickets sold very fast for this special public two week run of Kill Bill. A big reason for that is it is the way Tarantino intended the film to play and its the first time general audiences have had a chance to do so. You still have a chance to see it for yourself too! April 6th and 7th tickets will only be sold at the box office on a first come first served basis. So if you want to see Kill Bill as one film you'd better plan to be in Los Angeles on April 6th or 7th and get down to the New Beverly early to line up. Stay tuned for my final post on Tarantino's March Madness summarizing the entire month as well as the experience of Kill Bill: The Whole Bloody Affair and checkout my previous posts on the amazing month of programming with Part 1, Part 2, Part 3, Part 4, Part 5, Part 6, Part 7, Part 8, Part 9, Part 10 and Part 11.